By now, if you haven’t seen it, you’ve definitely read about the accident Lena Dunham’s character on HBO’sGirls had with a cotton swab. Intense, deep swabbing left a cotton swab lodged in her ear, and she needed to enlist the help of a doctor. Granted, this is an exaggerated exception to the rule. But over the years, cotton swabs, like Q-tips, have gotten the short end of the stick when it comes to ear health. What once was a convenient way to get rid of ear wax (scientifically know as cerumen) is now believed to hurt more than help. What’s so bad about ear wax anyway? And how does anyone clean their ears without a cotton swab? We’re glad you asked. Cotton swabs are primarily used to remove ear wax. Only ear wax is what promotes ear health. “Ear wax has antibacterial and antifungal properties. It keeps the ear canal skin protected from getting too dry and is a natural cleaner of the ear canal,” Dr. Jeffrey Spiegel, a professor in the department of otolaryngology at Boston University School of Medicine, told Medical Daily in an email. The amount of ear wax, as well as the color and the consistency (soft versus hard) varies person to person, Dr. Ronald Hoffman, medical director of the Ear Institute at New York Eye and Ear Infirmary of Mount Sinai, told Medical Daily in an email. 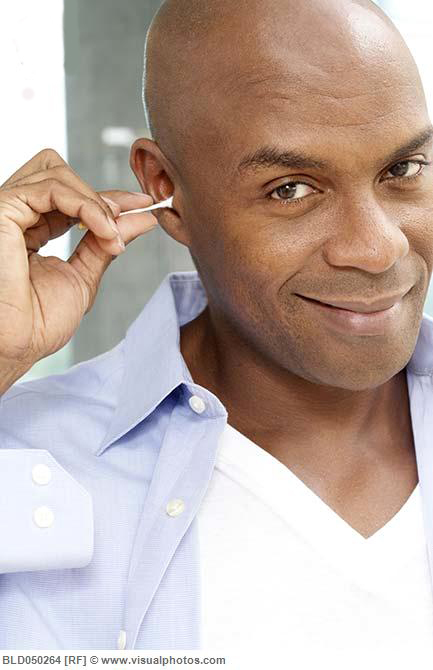 Ear wax naturally migrates to, and naturally leaves, the outer edge of the ear. Anything that prevents the wax from moving out — like, say, constantly walking around with headphones in — can result in build-up. A 2008 JAMA study found ear wax build-up results in 12 million patient visits per year. Beyond headphones, excessive ear hair, narrow ear canals, and bony growths called exostoses lead to build-up, said Spiegel. The growths tend to occur in people who surf, and anyone swimming in cold water may stunt the wax migration process. Obviously keeping build-up to a minimum is key. While cotton swabs are great for cleaning the outer ear, they pose real risk to the inner ear. Hoffman added pushing cotton swabs too far into the ears damages the delicate structures of the middle and inner ear, which can cause permanent hearing loss (a health problem linked to cognitive impairment later in life), bleeding, and redness. Surprisingly, the best way to clean ears is not to. Swimmer’s ear is best prevented, Spiegel suggested, wearing wax earplugs and waterproof foam ear bands to keep water out of the ear. More severe cases should be seen by an otolaryngologist for antibiotic ear drops. Dr. Sean Hashmi, a practicing physician at Keiser Permanente in San Francisco, told Medical Daily in an e-mail he’ll sometimes soften ear wax with liquid docusate, which is normally a stool softener. There’s also new products called OTO Tip (achieves basic cleaning) and the TEC Home (removes wax plugs) under a startup company called Clear Ear. The bottom line: Keeping wax build-up at bay isn’t limited to a cotton swab, and it’s definitely not fixed with a bobby pin. Yikes.